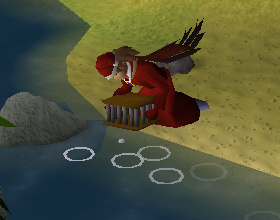 Fishing is an important skill that many RuneScapers rely on for food, since there are many areas full of healthy fish to catch. Other people choose to sell their catches for money, or trade them for other things that they can use. Since there's a variety of fish to catch, and many places to go fishing, this is an enjoyable skill. But of course, there are several kinds of lures and other tools to use, and Members can even take part in an Activity which involves the Fishing skill! In order to start fishing, you're going to need to buy something to catch the fish with, and if needed, some sort of lure. The fishing shop in Port Sarim has a multitude of fishing gear, and they'll even buy the assorted fish that you catch. There's also a store in Catherby that sells Members' gear such as Big Nets. Once you've gotten everything together, find a sparkling fishing spot in the water and click on it. You may need to right-click to get the correct option. Your character will continue fishing until your backpack is full, or you click somewhere around you. Each fish can only be caught with specific equipment, so it's best to buy those things to catch the fish. Big Fishing Net Mackerel, Cod, Bass It's possible to catch multiple fish and items with this item. Oily-Fishing Rod & Bait Lava Eel Used during the Heroes' Quest. Barbarian Rod Leaping Trout, Leaping Salmon, Leaping Sturgeon Used in Barbarian Fishing. Uses Feathers, Fishing Bait, Roe, Fish Offcuts or Caviar as bait. Hand-Bait Tuna, Swordfish, Shark Used in Barbarian Fishing. Once you begin to get better at fishing, you'll be able to fish for a wider variety of fish. Once fish are cooked, they can heal your lost Life Points from a fight, and many warriors depend on skilled fisherman to sell them food. After you become an experienced fisherman, you can make a great deal of money in this trade. Crayfish 1 10 Tutorial shore (Near Fishing Tutor), pond west of Farmer Fred's farm. 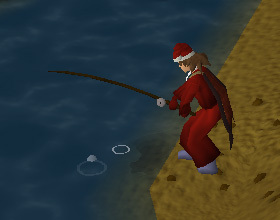 Barbarian Fishing is a method of Fishing availale to members with 48 Fishing, 15 Agility and 15 Strength. To begin, speak to Otto Godblessed located in his house near the Baxtorian Falls and ask about the Barbarian Fishing methods. He will tell you about Fishing with a Heavy Rod and bait to catch Leaping Trout, Leaping Salmon, and Leaping Sturgeon. Next, you can learn about Fishing for Tuna, Swordfish and Sharks without a Harpoon. Since you are using your hands to catch these fish (known as Hand Baiting), the required Strength level to catch them is higher. Every so often you will catch things in your Big Net that aren't fish. Some of these things are useless and can usually be discarded from your inventory, but sometimes you will come across an unusual object or two which are more valuable. Stiles, located south of the entrance to the Karamja Volcano, will note both raw and cooked Tuna, Lobsters and Swordfish for free.